For better or worse, it’s getting easier and easier to plug in everywhere you go. Whether you need to stay connected for business or just want to stay in contact with loved ones, you’ve got options. Today, TPG Senior Points & Miles Correspondent Nick Ewen explains just what those options are. We live in a digitally connected world. Many of you would probably struggle to think of the last time you went more than a few hours without using a laptop/tablet/smartphone (while awake, of course). With technology continuing to advance at a rapid pace, there are more methods to stay in touch today than even a year or two ago, so today I want to go through the various options for staying connected while you’re away from home. Hopefully these suggestions will come in handy the next time you’re on the road! Staying connected at the airport is getting easier and easier. Photo courtesy of Shutterstock. The typical airport can be a beehive of activity, and fortunately, it’s becoming easier for you to stay connected when departing from, transiting through, or arriving at a given airport. When I first started traveling for business several years ago, I encountered many airports with only paid options for accessing the Internet, but that’s quickly becoming a thing of the past. The lone exception is New York JFK, which charges $4.95 per hour or $7.95 for 24 hours of access. Though some airports don’t provide free internet to all passengers, there are other ways you can stay connected. Most airline lounges have their own WiFi networks, and many provide computer workstations in case you left your device at home (or allowed the battery to die!). I have even visited lounges where the network doesn’t require a username and password, so if you’re in the terminal near a lounge, you may be able to gain access without entering the club. If you hold the Amex Platinum, the new partnership between Boing and American Express gives you free internet at over a million hotspots worldwide. Another way to stay connected is through a membership with Boingo Wireless, the provider most commonly found in airports around the U.S. There are a variety of plans available, but if you currently have The Platinum Card from American Express (or a business or corporate version), you can enroll in the Boingo American Express Preferred Plan, a benefit added to the card as of June 2014. Through this partnership, you can access over 1 million hotspots worldwide on up to four devices at once with no roaming fees or data caps. Even at airports with free WiFi, a Boingo membership can give you access to premium internet and higher speeds, so this is a great way to stay connected while you travel. Delta is one of many carriers with in-flight WiFi through Gogo. Alaska: most planes are equipped with Gogo in-flight internet. American: most planes are equipped with Gogo, and American is currently adding Gogo to all new two-class regional jets. Delta: just about all two-class planes are equipped with Gogo; Delta plans to add satellite-based coverage for international flights in the next year or two. JetBlue: currently adding Fly-Fi to its planes, with all A321 and most A320 aircraft already equipped. Southwest: currently adding WiFi to its planes. United: currently installing satellite-based WiFi on its entire fleet (aside from 757 p.s. routes, which have Gogo). US Airways: approximately 90% of domestic flights have WiFi coverage through Gogo. Virgin America: fleet-wide access to Gogo. If you aren’t loyal to a specific airline, you may want to consider an unlimited monthly pass (currently $59.95 per month). This will give you access to WiFi on all participating airlines: Air Canada, Alaska, American, Delta, United (p.s. routes only), and US Airways. Otherwise, you can browse the individual purchase options when the plane reaches 10,000 feet, including hour, flight, or day passes. One way you can avoid these costs is by with The Business Platinum® Card from American Express. As of last month, cardholders receive 10 complimentary Gogo passes each year. With all-day passes usually costing $16, this is a great way to get $160 of the annual fee back in your pocket (See Rates & Fees). 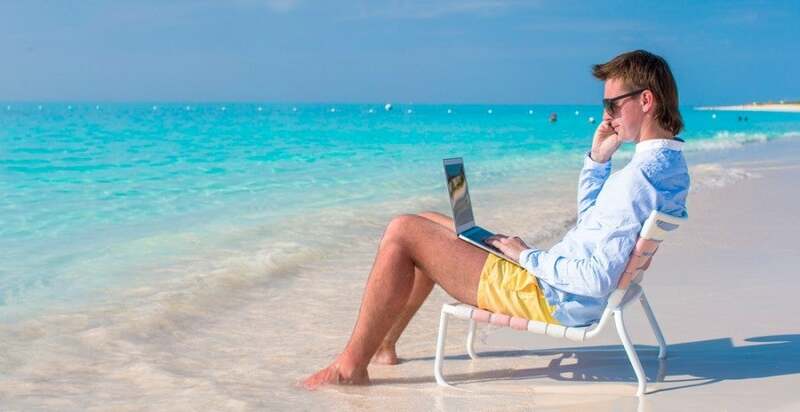 You may not want to stay connected when visiting a secluded beach, but many carriers allow it! Photo courtesy of Shutterstock. Once you land in a foreign country, one of your first actions may be to turn your phone on. If you only have a nationwide plan, you’ll likely encounter one of two things: no service or roaming service. The latter of these two can be incredibly pricey, so before you travel, be sure to investigate what your carrier offers. First, think about how you will be using your phone abroad. Do you need to make phone calls? Will you need data, texting, or some combination? Do you need service everywhere, or will WiFi suffice? The answers to these questions will help you decide what plan to pursue. If simple WiFi access won’t be enough, many carriers offer add-ons (or included services) to keep you connected. T-Mobile is typically viewed as the leader in this arena, as all Simple Choice plans include unlimited data and texting in 120+ countries for no extra charge. Verizon’s global plans, AT&T’s Passport offerings, and Sprint’s International Data packs give you a specified monthly data allowance abroad for a flat rate. If you’d rather pay-as-you-go for data and/or texts, that’s an option as well, though be prepared for relatively high charges. If you need the ability to make voice calls abroad, carriers give you several options. Again, T-Mobile stands out, with flat rate calling (20 cents/minute) to covered countries available on all Simple Choice plans. AT&T’s Passport packages offer discounted per minute pricing; your actual rate will vary depending on the package you select. Sprint and Verizon also offer “discounted” pricing when you add global voice to your plan (both charge $4.99 per month). Unfortunately, the resulting rates are inconsistent across countries, and can get as high as $5.99 per minute! See a country by country breakdown for Sprint here and for Verizon here. Online options like Skype are easy to use and generally less expensive. Skype: Offers free phone calls and video-chat over WiFi connections with other Skype users, and allows you to make calls to international landlines and cell phones (either pay-as-you-go or a flat monthly fee). Skype’s “Unlimited World” package, usually $13.99 per month, offers a free month trial so you can test drive the service. 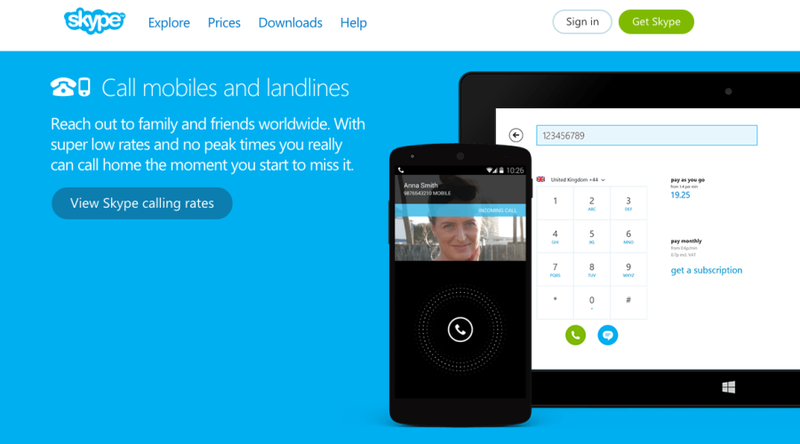 Vonage: Similar to Skype, Vonage offers customers two different apps for international calling. The standard mobile app allows you to call other Vonage app users around the world for free. If you’re a current customer, however, you can download the Vonage Extensions app and use your smartphone to make international calls when connected to WiFi, regardless of your location. Google Hangouts: If you have a Google+ account, you can access the Hangouts feature and video chat with friends and family over WiFi. You can also place calls to the U.S. and Canada for free, and calls to other countries are available at low rates as well. Rebtel: This service allows you to make international calls using an app over WiFi or data, but Rebtel also provides local access numbers, which is great if you’re staying in a hotel that gives free local calls. Your first call is free, so you can try it before you commit. Keep in mind that all of these apps and services use data to make calls, so you must either connect to a WiFi network or plan to use local networks. The latter of these will likely result in significant fees, so be careful when you use them! As of January 15, 2015, Marriott Rewards offers free WiFi to all its members — not just elites. In November, Marriott announced that all Marriott Rewards members would receive free internet when booking rooms through “official” channels. In December, Starwood Preferred Guest made a similar announcement, giving free internet to all SPG members (as of February 2, 2015) who book rooms through “official” channels. Just a week later, Hyatt joined the party by announcing that all guests would receive free internet starting in February 2015, regardless of booking method or whether they belong to Hyatt Gold Passport. Finally, just last week, Hilton HHonors announced policy updates similar to Marriott and SPG, with free internet for all Hilton HHonors members who book through an “official” channel. In addition to these offerings, if you have certain levels of elite status with these chains, you’ll now be able to access complimentary premium internet for faster browsing. This isn’t the only way to stay connected in your hotel. As I wrote about in November, there are other methods for gaining access without paying, including booking a room rate or package with free internet (such as a club room or suite), negotiating for free internet at check-in, or connecting in the lobby, which you can often do for free. While many of you take vacations to get away from it all, staying connected on the road can be an absolute lifesaver. If you plan ahead, you can keep in touch with friends and family members virtually anywhere in the world without breaking the bank. How do you stay connected when you travel? For rates and fees of the Amex Business Platinum, please click here.